let us a take moment of silence to appreciate the lengths nails polish has come in the last two years. seriously though, polish collections usually contained the occasional glitter or metallic finish. currently we are enjoying textures, holographic colors, mixed glitters, varying finishes and a wide array of nail art. let the heavens open and clouds part while we hear the angels singing 'hallelujah'. expressing your personal style has never been easier (or this inexpensive!) and nails make the perfect canvas for that. 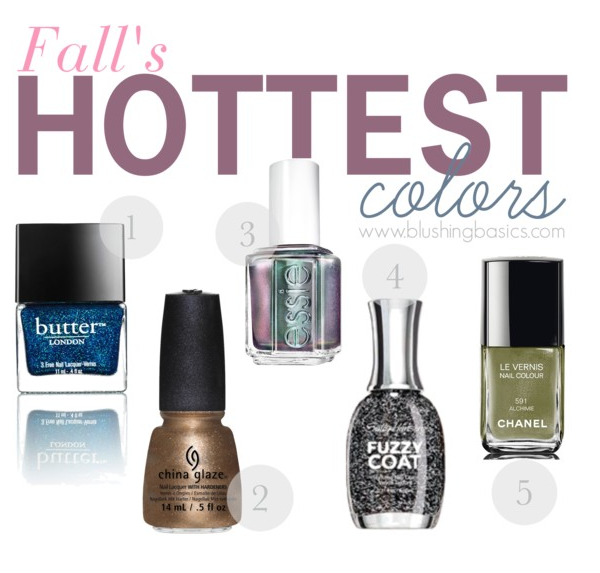 butter LONDON, Inky Six: a mixed metallic glitter sure to be seen on the hands of rockstars everywhere. China Glaze, Goldie But Goodie: gold is the season's hottest accent and what better to accent than your nails? all the more better for fashioning, my dear. essie, For The Twill Of It: this holographic polish by essie will quickly be selling out in stores everywhere. a must-have for the season and the perfect accompaniment to every outfit. Sally Hansen, Fuzzy Coat: the latest craze in polish textures are the fuzzy coats. pick 'em up in varying shades to layer over your latest mani for the coolest texture effect in town. Chanel, Alchimie: one of the best nail polishes, but also the most expensive, Chanel gets it right erry time. army green, anyone? I am in LOVE with that Essie shade! It's gorgeous! Even though I don't need the Essie, I can't help but want it. Fabulous post, right up my alley. I'm loving all of them, except for the fuzzy stuff. Can't seem to get beyond the thought of lacquered dryer lint. LOL. Polish sure has come a long, long way!